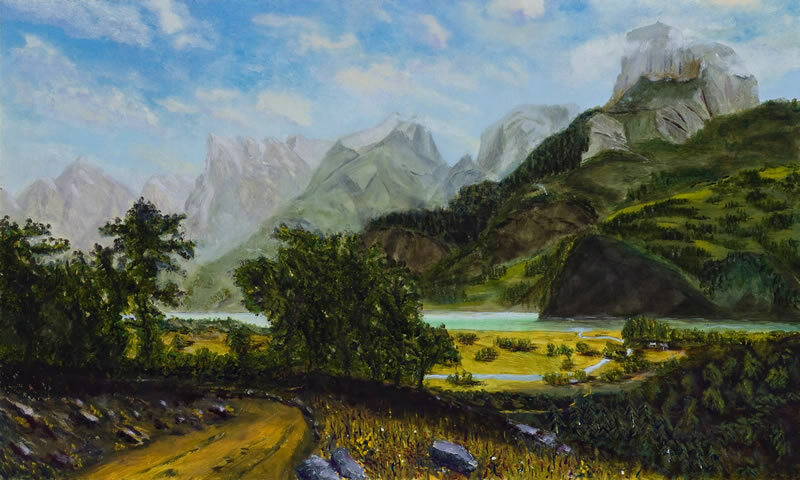 This is a 24 in x 40 in study of Albert Bierstadt's painting of Lake Lucerne, from 1858. His original is hanging at the National Gallery of Art in Washington D.C. His original painting is ten feet wide and six feet tall. For me this started as a classroom exercise in establishing value under the tutelage of David Campbell. The point was to get the most distant clouds, mountains and sky to dissappear when viewed through a red filter. Later in the year, at my first show, David commented on the finished painting, "You've sculpted it. I think Bierstadt would be honored."